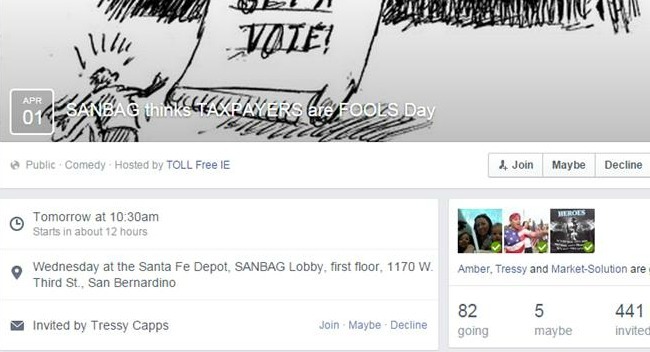 One of the items before the board of San Bernardino Associated Governments (SANBAG) is a draft on how toll lanes would operate and how money would be collected and spent at the board’s regular meeting that starts at 10:30 a.m. on the second floor of 1170 West 3rd St. in San Bernardino. The Board is currently looking at two plans to bring toll lanes to the 10 freeway from Pomona to Redlands and the 15 freeway from Riverside to Hesperia. The current Toll Lanes and Toll Roads in Southern California go mostly unused and empty leaving more freeway unused when traffic is already so bad. To make matters worse lets not forget the lower economic status of most Inland Empire residents so to levy a new FEE on residents seems heartless. Their is mixed reaction to the idea and it seems the crowd against Toll Lanes has the most community support but is getting snubbed by the County Board. “Carpool lanes are being considered for I-10 because that freeway is more heavily used, said SANBAG spokesman Tim Watkins. Approving the toll policies will allow the project study process to move forward, he said.